Great! You may say – Finally a means to add fixed pricing to TaxiMap, but is it a step too far we ask ourselves….? Making it this easy to provide fixed price journeys may mean the price per mile model becomes neglected, misused, and misunderstood, but it is a vitally important part of the system as it takes care of all those other journeys. Let’s consider both fixed and flexible price calculations beginning with the new TaxiMap Zone to Zone pricing feature…. Previously, zones only permitted the price per mile of a taxi journey to be adjusted when a stop on that journey falls in that zone. (TaxiMap zones are geographic regions drawn on the map.) This works well for busy or congested or distant areas where standard pricing might not apply. However, it doesn’t account very well for discounted and/or return journeys, such as airport transfers, and journey prices are still calculated based on the overall distance. Zone to Zone pricing takes advantage of pre-exisitng zones already identified by mini cab companies through the TaxiMap user interface. It detects when a customer journey starts within one zone and ends somewhere in another with no other stops. If these criteria are met, it can then check to see if there is a dedicated fixed price for this journey. Dedicated Zone to Zone prices are allocated by users in their TaxiMap profile. Route agnostic: Zone to zone prices are route agnostic so, whilst different routes may be plotted on the map, the price won’t vary. 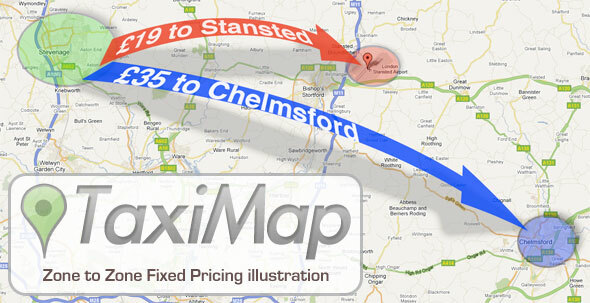 Using a price per mile model is TaxiMap’s primary function. Pricing this way makes much more sense for modern online interaction with customers. It also requires (overall) much less work from minicab/taxi companies to set up – since only one value needs to be provided (the price per mile) which applies to any journey. The Zone to Zone feature is great, but it shouldn’t be considered a replacement…. Customers are most satisfied when they are presented with accurate and competitive pricing for any journey, and TaxiMap provides the means to do this in an innovative and intuitive way. Considered first should be a journey from one arbitrary location to another, and how that should be priced. Configuring price per mile (PPM) settings will provide a means to calculate most random journeys. Next, journeys where standard pricing cannot be applied should be considered. For example, a trip to a congested area or beyond usual range. In this case, Zones can be defined that alter the price per mile (either applying an increase or a discount). Only a few zones need be defined since the standard PPM should apply to the majority of journeys within the normal operational area. From this we can see that TaxiMap price calculations are always built from a foundation of a single price per mile value, and this is why it is absolutely vital that this setting is not ignored. PreviousAdapting to online: Responsiveness is key! 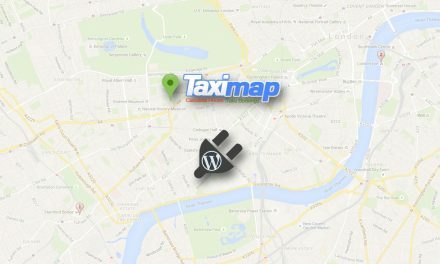 Is TaxiMap right for your cab company? Really enjoyed your blog post and agree that the fixed price feature should be viewed as an ‘option’ only. The great thing about PPM is that, when you need to adjust your prices, ultimately you can do this easily as only 1 variable needs changing. Also, where fixed pricing is concerned, I generally put these on the homepage of my site as I don’t have too many fixed price destinations. The great thing about the Price Per Mile is that it provides a more accurate fare estimate for a plotted journey especially where multiple stops are concerned. An additional note on zone to zone fixed prices… As of v3.9.31 journeys that only stop in zones with fixed pricing defined will generate a price based on the sum of the fixed prices. For example, if a journey starts in ZONE1 and proceeds to a 2nd stop in ZONE2, then concludes in ZONE3, the price will be based on the [fixed price between ZONE1 and ZONE2] + [fixed price between ZONE2 and ZONE3]. If any of the zone to zone journeys do not have a fixed price, TaxiMap will use a calculation rather than a fixed price.